With Altrincham more than holding their own against their more highly placed opponents, a very harsh decision by referee Roberts to award Alfreton a penalty for handball against Peter Band deepened Altrincham's play-off worries. Knapper converted the spot-kick (42 mins). With Alfreton showing little interest in adding to their fortunate goal, Alty enjoyed a lot of second half possession but could not score. The game descended into a bad tempered affair in added time at the end of the game. Firstly, Alty's Maddox was sent off (right) for taking a kick at Sale before Bettney followed him for an early bath after raising his arms against Aspinall. Mr Roberts was escorted from the pitch to a chorus of boos. Altrincham remain 13th. Alfreton Town arrived at Moss Lane, for their sixth game in 12 days, having never scored against Altrincham in a league match. 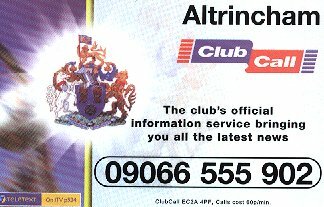 However, they are a much different proposition now from the relegation side which lost 5-0 at Moss Lane and 3-0 at home to Alty in 1997/98. This season Alfreton have easily qualified for Alliance North and drew 0-0 with Alty in the opening match of the campaign. Whilst Town's former Alty striker Tony Hemmings has now gone out on loan, familiar faces in their line-up include former Rushden man Mark Sale and John Knapper, who scored a penalty against Alty for Ilkeston a couple of seasons ago. Alfreton's latest find is left winger Stephen Woolley (19), who won a man of the match award in his full debut last Saturday. Their Supporters' Player of the Season award had recently gone to Ian Robinson. Alty welcomed back injured duo Steve Aspinall and Stephen Rose, with Rose replacing Gary Talbot who had been injured last Saturday. Talbot was on the bench this afternoon. There was no place for Jamie Almond despite his promising debut as substitute at Burscough as Steve Lunt reurned to the starting line-up but, once again, he was on the left rather than in his customary youth team position as a striker. Peter Band was the unexpected choice as Hallows's partner up-front, as Matt Bailey dropped to the bench, where Kieran Lugsden came back into the squad. There was no place for Ryan Hutchinson, who had started at Burscough. Alfreton included former Barrow captain, Mark Hume, who had recently joined for a small fee. Up-front, Mick Godber was fit after recent injury. ALTRINCHAM (Red & white striped shirts, black shorts and red socks): 1. Stuart COBURN, 2. Steve ASPINALL, 3. Barry SHUTTLEWORTH, 4. Mark MADDOX, 5. Stephen ROSE, 6. Ged KIELTY, 7. Jamie BAGULEY, 8. Ian CRANEY (capt. ), 9. Marcus HALLOWS, 10. Stephen LUNT, 11. Peter BAND. Subs: 12. Kieran LUGSDEN, 14. Matt BAILEY, 15. Gary TALBOT. ALFRETON TOWN (Blue shirts and socks, white shorts): 1. Lee BUTLER, 2. Ian ROBINSON, 3. David HOLMES, 4. Mark BLOUNT (capt. ), 5. Mark HUME, 6. John KNAPPER, 7. Chris BETTNEY, 8. Matt FISHER, 9. Mick GODBER, 10. Emeka NWADIKE, 11. Stephen WOOLLEY. Subs: 12. Mark SALE, 14. Anthony TANSLEY, 15. Adam TYLER. After changing ends, Alfreton kicked off towards the Golf Road End. Altrincham won two corners in the first minute, the first through Hallows's efforts. With both sets of supporters giving their sides vocal support Altrincham carved out a good early chance when Baguley found Band who, in turn, crossed the ball for Hallows. However, Hallows failed to control the ball whilst in a good position, six yards out (5 mins). Blount soon had to concede another corner from Baguley's cross and then Hume conceded a fourth flag-kick with only 8 minutes on the clock. But corners rarely produce goal threats for Altrincham and so it proved again this afternoon. With Altrincham enjoying the better of the game, another chance came when a freekick from Aspinall dropped, via Hallows, for Band whose shot was well saved by the unsighted Butler (9 mins). The game then went through a fairly uninspiring few minutes with freekicks to both sides. Craney then wasted an opportunity to shoot, choosing instead to take an extra touch on the edge of the box, only for the ball to be lost (19 mins). But Alfreton came close to taking the lead when Woolley went easily past Baguley on the Alty left and chipped a shot over Coburn which bounced out off the top of the cross bar. However, Alty soon won their fifth and sixth corners of the match but again produced no threat from them. Butler did well to save Craney's 25 yarder soon afterwards (28 mins). Altrincham continued to give as good as they got against the much higher-placed Alfreton but the game continued to be punctuated by freekicks (35 mins). Alfreton finally won a corner (39 mins) from which Hume's nod was almost converted by Godber but he could make no contact with the ball. Soon afterwards, when Craney got past Knapper, the Alty captain's ambitious 25 yard shot went wide (40 mins). Next, after an Aspinall push on Woolley had conceded a freekick near half-way, Holmes's free-kick dropped harmlessly in the Alty box where it bounced up and struck Band's arm as he faced away from goal near the outer-edge of the box in a central position. With a more vociferous appeal coming from the unsighted visiting fans than from the Alfreton players, referee Roberts surprisingly pointed to the penalty spot. On such decisions can relegation and promotion be decided. John Knapper, who had scored a penalty for Ilkeston against Alty a couple of seasons ago, placed his spot-kick to Coburn's left. Though the keeper guessed correctly, he was beaten by the shot into his left-hand corner (42 mins). Before the interval, a late tackle by Nwadike, saw the Alfreton man booked. In the two minutes of added time, Craney ran up a blind alley before the half ended, just after Nwadike had shot wide when Rose had lost possession. Until the penalty, Altrincham had been more than holding their own but they now faced an uphill fight against a resolutely defensive Alfreton side. Altrincham started the second half and went on to enjoy plenty of possession. Craney soon ran again into a blind alley but it was the visitors who had the best early opening when Godber got behind Maddox but as the central defender kept the striker under pressure, Coburn came out to block well (54 mins). A minute later the Alty keeper was again smartly out to cut off Bettney before Craney's advance at the other end won his side another corner. Even at this early stage Alfreton were showing signs of timewasting but they nearly paid for it when Band beat Butler in the air to Aspinall's freekick but his nod goalwards was cleared by a covering defender (59 mins). Craney and Lunt then combined well and from the latter's cross, Maddox's header forced a decent save from Butler (60 mins). Craney next got in a shot which looped off a defender narrowly wide for Alty's eighth corner of the game. This was scrambled clear and Alfreton then took off Godber and brought on the 6ft 5in. Sale (63 mins). Soon afterwards, Alty brought on Talbot for Rose at centre-back (65 mins). Altrincham continued to press without creating any real opening. Now, Lunt went off and Lugsden replaced him (67 mins). Lugsden went up front as Band retreated to midfield. From a Shuttleworth cross, Hallows's deflected shot won another corner which was soon followed by Alty's tenth flag-kick of the game, won by Maddox (73 mins). Alty were now pushing their centre-backs forward as Kielty remained the anchor at the back. Alfreton were content to sit back and absorb the pressure and, indeed, their directors were shouting to their players to head for the corners of the pitch whenever anything approaching an attacking opportunity arose. They nearly paid for their negativity when a cross from the right by Baguley found Lugsden unmarked at the near post but he steered his header narrowly wide from 8 yards or so (83 mins). At this point Baguley was replaced by Bailey and there soon followed a desperate scramble in the Alfreton box following an Alty freekick. As Alfreton continued to wind down the clock Kielty found Maddox, who in turn found Lugsden and the youngster shot the ball into the net, only to be given offside just before the 3 minutes of added time were announced. With the Alfreton contingent in the directors' box still exhorting their players to get "in the corner" to waste time, Peter Band was announced as Alty's Man of the Match. As Band had been the victim of the penalty decision and as no one really had particularly stood out for the home side, the award was arguably a dig at the referee as much as anything. With the game entering the last minute of added time, Mark Maddox took a kick at Sale, off the ball, as the two players tracked across the edge of the Alty box. The Alty centre-back predictably received his second red card of the season, both having come against Alfreton. But more trouble was to follow as Bettney raised his arms against Aspinall when the ball went out of play and he, too, was rightly dismissed though he seemed to think he could argue about it. Shuttleworth was lucky that the officials did not see his act of retribution. This second dismissal set off heated verbal exchanges in the main stand before the whistle went to end a game which had been ruined form Altrincham's point of view by a questionable penalty award. As in the first half, Mr Roberts left the pitch to a chorus of disapproval. Altrincham looked to be quite capable of taking at least a point from Alfreton this afternoon but once they went behind they had to try to break down a team of limited ambition whose defence held firm. To lose in such circumstances is hard to take but if Altrincham, can keep battling like this till the end of the season there is still hope of avoiding the tension of the play-offs. Once again, winning the corner count by a huge margin (10-1) was scant consolation for the loss of three points.